Know your budget – Knowing how much you have to spend on renovations up front is very important, because you will be able to divide up your money evenly and use your money in the best way possible. Also, if you know your budget early on in the renovation, you can decide what items you want to splurge on and which items you want to keep more basic. For example, you may want to splurge on taps and finishings, but you may want to save on tiles for the floor. Figure out what you want out of the space – No bathroom is created the same, and you need to figure out what you want and need out of the bathroom before you begin the renovation. For example, if you have a small ensuite bathroom, you won’t need a lot of the same details and features that you would for a large bathroom for the whole family and vice versa. Find out some standard dimensions – Most items like baths, toilets and sinks have a standard measurement that each of them follows, so if you can figure out rough estimate and a space for some of your features, then it will be easier when it comes to installing them later on. Of course, it is important to measure every area and every feature before you install them but knowing roughly how much space you have for each item before you decide on which one you want to buy will give you a bit of a head start. Consider space-saving options – If you have a relatively small space to work with, then it may be important for you to find items that help you optimize the space that you have. 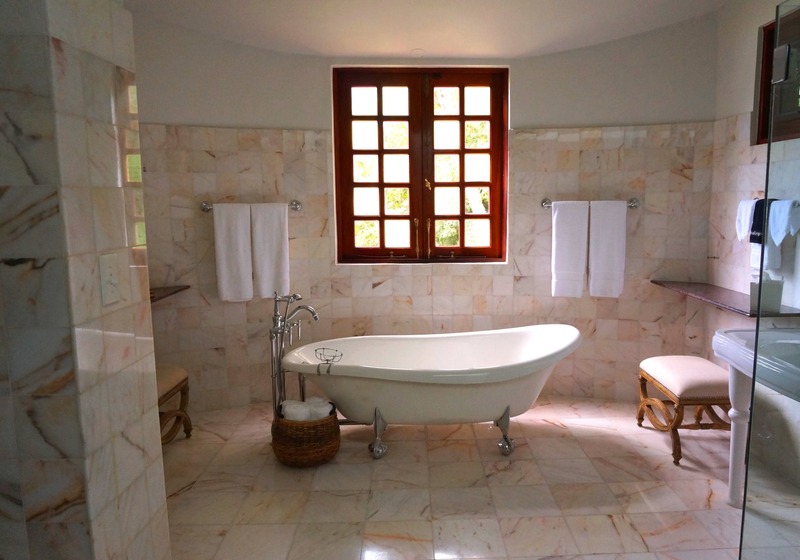 For example, having a small sized bathtub may free up more space for you to have a separate shower in your bathroom, rather than combining the two which has been done traditionally. Or you may decide you don’t need a bath at all which could be another 5ft that you use for something else. Placement of any features in your bathroom is crucial, and can make or break the space, so making sure you optimize different space-saving techniques can really help you get the most out of the room. Try not to move the pipework – Moving the pipes is another cost that can come up in your bathroom renovation, and it can be very pricey if you want to re-shuffle the whole bathroom. If you can help it, you’re definitely better off leaving the pipes where they are to save on renovation costs. For example, if there is a spot in your existing bathroom where the toilet is and it doesn’t cause you any problems where it already is, you’re better off leaving in the same place, rather than shifting the pipes to put it in another spot. Know when to DIY and when to hire a professional – It can be tempting to try and do it yourself with your home renovations, but if you’re not experienced in any of the tasks that need to be done, it is always best to hire a professional. While some tasks may be easy enough to do on your own, if you have any doubts, it is always best to get an expert to help. Although the possible savings may seem tempting, they can often be too good to be true, and you’ll end up hiring someone to fix your own mistakes anyway. Therefore, if you hire someone to begin with, you’ll get everything right the first time and you won’t have to add any more to the large cost of the renovation. In saying that, if you do have some basic know-how, jobs like hanging some shelves or even installing a toilet can be easily done by yourself. Doing small jobs like these can save you a little bit of money and you can put it towards other parts of the renovation that you may need some more help with. Know when to spend a bit extra – As mentioned before, knowing your budget is very important, but knowing how to spend your money is also very important when renovating a space. There are plenty of ways to cut-corners with your renovations to get the best value for your money, but with a few things, you’ll find that you need to spend a bit extra. Taps and fittings for example, may seem like a trivial detail to focus on when renovating a bathroom, but they are something that will be constantly used every day, and can add a little touch of class to the rest of the room. If you’re looking for high-class taps and finishings for your newly-refurbished bathroom, then look no further than Bravat Tapware. These taps and finishings are designed to be simple and neat, while adding a touch of grace to your space, and make a perfect addition to any bathroom or ensuite or kitchen. With over 100 years of experience design and selling quality products, you’ll be sure you’re getting value for money from any items in the Bravat range. The products in the range are also environmentally friendly, water-saving and lead free, so you can feel good about how your purchase impacts on the environment in a positive way. Check your tile size – something that is extremely important in bathroom renovations is the tiles, and they can make or break your bathroom. But before you set them down on your floor, it is important to check that they are the exact measurements that they claim to be. For example, a tile may say it is 15 x 15, but this may be a rough estimate, you could end up with a few problems on your hands because of this. Also, where possible, check that the company that has created the tiles hasn’t used European sizing, because this can also make the dimensions differ slightly. Make sure the space is well-lit – Lighting in your bathroom may not seem like something that is very important initially, when you are designing or renovating your bathroom, but having a well-lit space is very important. Firstly, because the bathroom is an area of the house that is prone to mould and dirtiness, you’ll want to be able to see any build-up of grime properly so that you can keep the area clean. Also, having the space well-lit with some natural light from a few windows will help you to keep the area ventilated properly, which is very important with a bathroom. Try installing an exhaust fan as well, as this helps to keep the space ventilated. Factor in some storage space – It is very important to try and factor in some storage space somewhere in your bathroom, for all of your products and any other things you may need in there. Most people have a sink with a vanity and cupboard attached, which can give you a bit of storage, but you are sharing your bathroom, you may need some extra space. Although this usually comes after the renovation, when all of the features are already in place, designating an area for storage on your renovation plans may help you in the long-run when you start looking for extra furnishings and finishing touches for your space. These days, a lot of places sell bathroom storage cabinets and shelving units, and if you’re on a strict budget, you can even pick up some great items from Kmart and Target, at a fraction of the cost of other places.